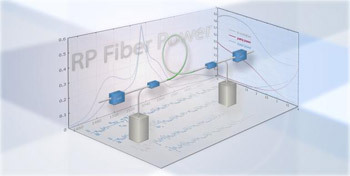 RP Fiber Power is powerful software for designing and optimizing fiber devices—in particular, fiber amplifiers and lasers, but also passive fibers. A new, more powerful software package (Version 5) now also provides numerical beam propagation modeling, which is useful for modeling fiber tapers and fiber optic couplers/combiners. For more information on the latest version of RP Fiber, please click here. 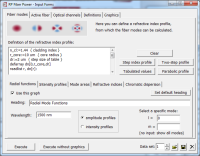 QUICK TOUR VIDEO: This video gives a quick tour through the whole RP Fiber Power software: how to calculate fiber modes, numerically simulate beam propagation, model a fiber amplifier or laser, simulate the propagation of ultrashort pulses, and how to do utilize the enormous flexibility of the built-in script language. Just click on the image below and wait for a few seconds. 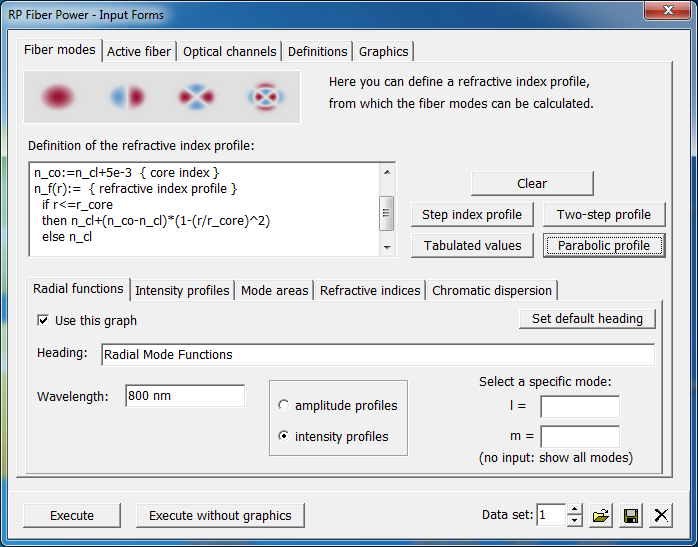 The mode solver can calculate the amplitude profiles, cut-off wavelengths, propagation constants, group velocities and chromatic dispersion of all guided fiber modes based on a given radially symmetric refractive index profile. 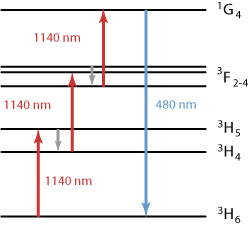 Arbitrary transverse modes can be calculated using customer supplied refractive index profiles. 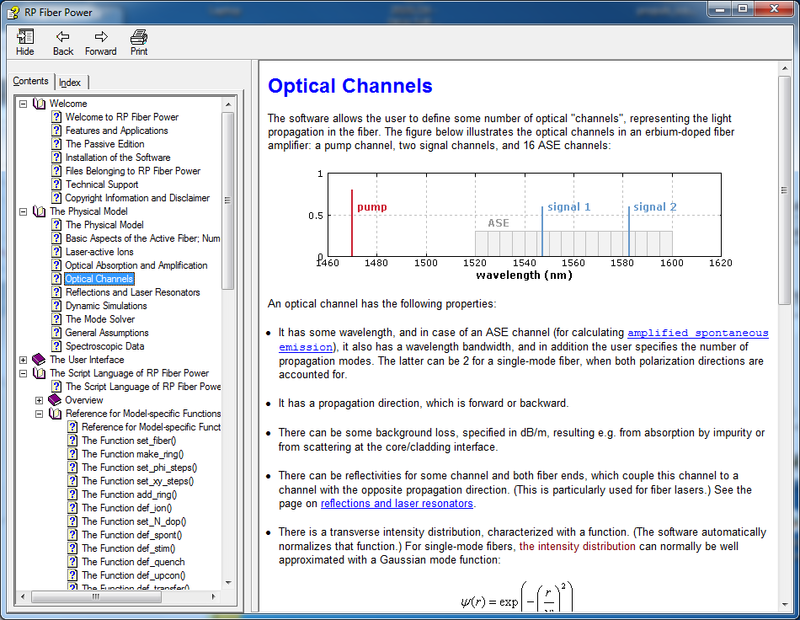 You may define any transverse intensity profiles of optical channels, as well as arbitrary transverse doping profiles, given by any formula, tabulated values, etc. As an example (image to the right), transmitted light through a multimode fiber is simulated, using calculated mode profiles from the mode solver. The script language has been used to decompose a misaligned input beam into modes, apply the mode-dependent phase shifts, and reassemble the modes to form the complete output profile. For fiber amplifiers and lasers, the software can simulate the activity of laser-active ions—even with freely defined level schemes and transition processes. 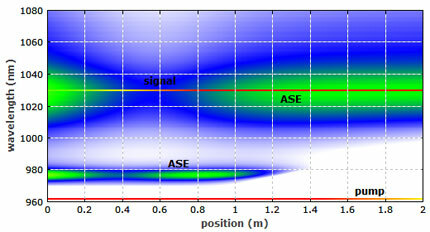 The user can define many optical channels for pump waves, signals and amplified spontaneous emission. The example provided is for 480 nm upconversion for Tm3+. 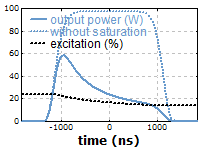 Apart from calculating steady-state power distributions in amplifiers, lasers and ASE sources with high reliability and an amazing speed, it is also possible to simulate the dynamical behavior—for example, of pulsed amplifiers or Q-switched fiber lasers. The software can be easily used by filling out the interactive forms. Enormous flexibility is provided by the powerful script language, allowing you to process your input or output data in essentially any manner. The software comes with comprehensive documentation: a carefully worked out PDF manual and an online help system. Competent technical support is included in the license fee, and the support can also be used for general technical consultancy on fiber devices. All support is provided directly from the software developer, Dr. Rüdiger Paschotta. This software is a must-have for anyone seriously working on fiber devices—be it scientific research or industrial development. Your productivity and competence will greatly benefit from this tool and the competent support. The software is also an excellent educational tool. See also the detailed PDF brochure and the comprehensive product description (including many example cases) on the website of RP Photonics, the producer.